The entire team at the Novotel Paris Centre Tour Eiffel hotel will be happy to welcome you to the heart of Paris. We are here to help, do not hesitate to contact us for your specific requests, before and during your stay. See you very soon! Stay in the heart of Paris! A 10 minute walk along the quays of the Seine to the Eiffel Tower. Come and discover the Musée d'Orsay, Notre-Dame, the Louvre and Champs-Elysées. 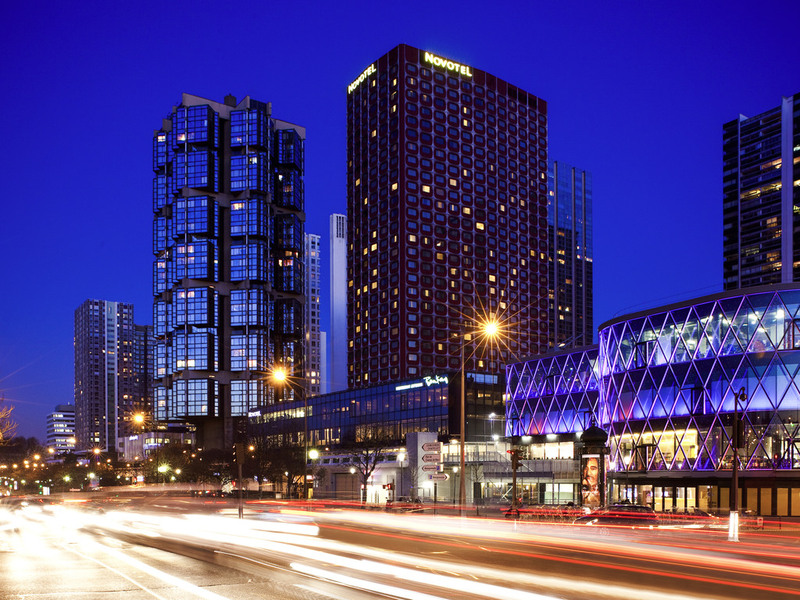 The Beaugrenelle district is undergoing a revival and offers the very best amenities, bakeries and terraces, as well as the new Beaugrenelle shopping center. Located right by the hotel, it boasts upscale shops, restaurants and a cinema. Facing the Seine, 8 minutes walk from the Metro 6 & 10 lines. Spacious, contemporary in design, and adaptable, the Novotel room is truly a place for living, perfect for all your needs. All our rooms, which measure at least 215 sq. ft (20 m²), feature a flat-screen TV, free WIFI, tea and coffee making facilities, safe and fridge. Enjoy unbeatable views of Paris from our Superior Rooms situated on higher floors. This is the meeting place for traditional Japanese gastronomy lovers. Sushi or Teppan Yaki at your choose. The Japanese restaurant, Benkay, a real Parisian institution, offers views of Paris and the Seine. Closed from 7/22 to 8/21/19. inclusive. In an intimate and chic setting, ideal for professional meetings, a cocktail with friends or a light lunch, come and share a pleasant moment in the cozy ambience of the new Q.G'renelle Bar. Lunch menu or daily specials available at lunchtime. L'Instant Nomade offers tasty and balanced food in a unique, friendly and cosmopolitan atmosphere. For something sweet or savory, or a cold drink, it offers the convenience of self-service. 24-hour vending machines. While organization of our event and related service was good, we had a mouse crossing the restaurant during our lunch and saw another one in the bar the same day at night. Also, in the restaurant several chairs were damaged and very dirty which is unacceptable especially knowing that this conference was for business aviation customers who have extremely high standards when it comes to cleanliness. Superb premises; bathroom very dangerous. Your staff is superb, your premises are excellent, your location is very good. The bathroom is very dangerous. There is no way of taking a shower and water not spilling to the floor. Bathtub is too high and there is no handle to get out of it. There are no spaces to put any of your personal belonging in bathroom or in room. Hotel staff was very accommodating. Room was a little dated, and the shower did not drain well at all, so it overflowed all over the bathroom. Enjoyed the view of the river. the location is great, and the lobby / bar area is fine. The room (3029) was dated, very unreliable hot water. The Asian lady working in the bar was terrible, no interest in her job. The check in was slow ( Accor Priority desk), and it seemed the info on my credit card deposit (500 euros) never really worked, and we had issues at the bar paying because of that. The breakfast was very average, crowded, dirty carpet, the bacon was so fatty and stuck together - the worst I have seen for ages. Only 3 fruit choices ( grapefruit, orange and pineapple - or a whole apple) . It took me 20 minutes waiting at reception to get the staff member to agree that we could have a bottle of champagne that was already paid for by our travel agent. Good. Hallways and hallway carpets need to be repaired/painted/replaced. We really enjoyed the location and the great view to the river, but the rooms were clearly lacking cleaning maintenance (eg one of the rooms got the toilet clogged up twice, sofa with big stains, holes in the floor); the staff in the pool (reception lady and some personal trainer fellow inside) were really, really rude with our family because the kids made some noise to leave the pool. Everything was good, very good even. But I can’t put 10 because of two little things. The room I had, had a view on the roof of an old building. And the second reasons are the chopsticks in the Japanese restaurant. Like the restaurant is so amazing and you use kind of sushi shop chopsticks ? Anyway, I would retourn because it was really minor inconveniences. The hotel is ok for a business traveller, although the large queues at the breakfast bar and sometimes at the check-in counter are not something for those with little time. If you are lucky and have a room at a higher floor with a view over the Seine the views are probably very nice. I had a room to the other side and had not so spectacular views, but for sure a much quieter room. The pool and the gym are quite good and not very crowded, but longer opening hours (morning and evening) would be nice. The Hotel bar is nice. For Accorclub Members, the possibility of having breakfast at the bar instead at the restaurant and the priority members check-in counters are welcome additions. However, the priority check-in is not always available and the bar opens just at 7:30 for breakfast. Great location, wonderful staff and very family friendly! Very good location, shared spaces, bar and meeting rooms good standard. Room was poor standard. Lack of information in room regarding amenities / services available. The staff was absolutely perfect, polite and very responsive. However the condition of the room is far from the satisfaction level, i.e. the floor cover was dirty from the long-time spots lefts. The room environment left quite sad impression. Charged me for breakfast even when I did not have any ! Friendly staff and good breakfast. I stayed here because it was the venue for a scientific conference. Very supportive staff, clean rooms. Breakfast and coffee very good. Conference facilities were good. Overall very positive experience.